If a week is a long time in football, then for Hibs players and fans a month must feel like an eternity. Four weeks ago today confidence at Easter Road could scarcely have been higher. They’d just defeated local rivals Hearts in the Scottish Cup after a pulsating replay at Easter Road. As opposed to being the apex of their 2015/16 campaign, the victory looked like heralding a truly special few months for the Edinburgh club. The Ladbrokes Championship title was still there to be fought for, while a League Cup final meeting with Ross County sat on the horizon. With that missed opportunity now in the rear-view mirror, following Sunday’s 2-1 defeat at Hampden, a season which promised so much is in real danger of ending in universal heartache. The contrast between the highs of beating Hearts and Sunday’s crushing low could be summarised in the emotions of centre back Darren McGregor. After helping his side to defeat their Edinburgh rivals, McGregor called it his greatest moment in football. It was easy to see why. A boyhood Hibs fan who worked his way through Junior and part-time football en route to signing for Hibs, McGregor realised the ambition of every young fan by pulling on the jersey of his heroes. However, for the same reasons, no-one in the Hibs dressing room felt as distraught after Sunday’s defeat. “I’m just devastated. You have all the anticipation and the build-up, with all your friends and family coming along to support you. I feel like I’ve let every single one of them down. It’s so hard to put into words just how much this hurts,” said McGregor. “Sometimes you come up against a much better team and you can accept that. Ross County beat us with two goals to one, so you can’t take anything away from them. But we still felt we’d done enough and we hadn’t, which is cruel. To look up and see all those fans disappointed, I can’t put it into words. “I think it feels even worse as a player because I feel we’ve let the 30,000 who travelled – and maybe another 100,000 watching at home – down. It was a great opportunity to win a first trophy in nearly 10 years. Fans will go home, analyse it and a lot of them will be able to get over it. As a player it can stick to you. You know you’ve had an opportunity to imprint your name in the history books. McGregor and team-mate John McGinn had been at Hampden in the same situation three years prior when St Mirren defeated Hearts to lift the League Cup. 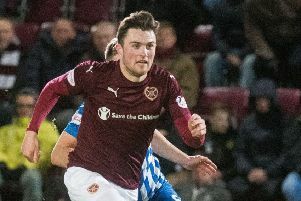 However, while McGinn played a starring role in the centre of the park, McGregor was forced to watch on having sustained the second of two cruciate knee ligament injuries he would suffer at St Mirren earlier in the season. Though experienced in bouncing back from football disappointment, in his own words, Sunday’s defeat will need an extra amount of effort to get over. That task begins tomorrow night when Hibs travel up to Inverness for a Scottish Cup quarter-final replay. The one solace for Hibs fans is that there’s still a chance of ending the club’s 114-year cup hoodoo, and success in the competition would erase the current pain in a heartbeat. “This is bad as anything I’ve experienced. It’s probably the worst low I’ve experienced, and that includes two cruciate ligament injuries. I could have sent half of Edinburgh home happy so it weighs heavily on my shoulders,” continued McGregor. “I didn’t play when St Mirren won it, so that was bittersweet as well. I felt like a bit of a fraud. So to have contributed this time and for us to fall short, I can’t get my head around it.